The long awaited NEMA Green Point office in Isiolo was finally inaugurated in a colourful occasion on December 16 in Isiolo County. According to United Nations Environment Programme, Green Economy is an initiative resulting in improved human well-being and social equaty, while significantly reducing environmental risks and ecological scarcities. Speaking at the launch NEMA Director General Geoffrey Wahungu thanked everyone for their attendance and the Danish government for their partnering in funding the construction of the Green Point office. Through the Danida programme Wahungu said that, “It has been possible to adjust to emerging challenges in the environmental landscape in Kenya”. Wahungu also added that it’s out of this and other programmes that realization of NEMA’s strategic objectives has been possible as well as the institutions continued upward curve. Wahungu was quick to note that the issue of green economy has brought attention both internationally and at the local scene, “it’s within this mandate that the Authority is undertaking a number of critical interventions in this area, among them the development of economic instrument guidelines geared towards changing public behaviour for a more sustainable and consumption pattern,” he said. In matters to do with private sector partnership, Prof. Wahungu said the Authority has engaged the private sector players to address a number of issues, among them energy audits of manufacturing plants. “It is our belief that structured engagements with the private sector will be a critical component in addressing Sustainable Development challenges in Kenya,” said Wahungu. Isiolo County is earmarked as one of the key cities for the establishment of a Resort City and a one on the LAPSSET project of the government. These, the director general said are very critical for the Authority, as there is need to give direction on the types of investments that are green. The Green point was well received in Isiolo Town with the Governor of Isiolo, Mr. Godana Doyo saying that the Green point is a unique initiative and thanked NEMA for considering Isiolo county for a green point. 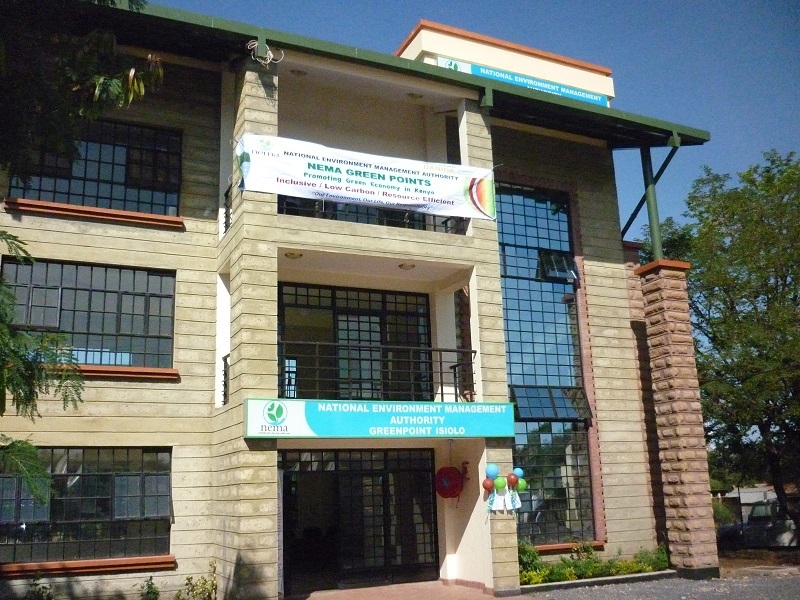 He said that the building is a land mark in Isiolo town and has been built up with ecofriendly materials. He said the county government of Isiolo will work closely with NEMA. The speech was read on his behalf by the County Executive for Tourism and Trade, Ms. Amina Omar. On behalf of the Governor, she said that the county government will work with NEMA in conjunction with the private sector, to promote environmental best practices and also contribute to sustainable development.